saints were “supposedly” buried there, it’s place on the list of holy, sacred sites had been sealed and the island became a place of pilgrimage. Since medieval times three pilgrimages to Bardsey Island were equal to one pilgrimage to Rome, and many still visit the holy island even today. St Cadfan died and was buried on the island in c540 as were St Cybi and St Dubricius. Legend says that Merlin the Magician lies sleeping in an unidentified cave on Bardsey. Unfortunately, there is no trace of the Celtic monastery, the scant ruins there now are, in fact, those of the Augustinian abbey of St Mary that was founded in 1240 and, the main part of that still surviving is a ruined tower (abbots lodging) and some foundations of the abbey church. The abbey did not survive the dissolution of the monasteries in 1537. In the ancient cemetary there are two modern Celtic crosses; the taller cross stands in memory of the third Baron Newborough and the other for the 20,000 saints who lie in un-marked graves on the island – 900 of these were monks who fled from the monastery of Bangor-is-Coed near Wrexham when it was besieged and burnt to the ground by King Ethelfrid of Northumbria in 607 AD. To the east of St Mary’s Abbey at Ty Capel is the holy well. This now supplies the island with its drinking water. Just east of Plas Bach is the hermit’s cave and near here stands the famous 1,000 year-old ‘Afal Enlli’ the Bardsey apple tree. At the northern side of the island at Penryn Gogar there are traces of round hut dwellings that belong to the Neolithic age some 5,000 years ago. At Ty Newydd farm some graves from the 10th-11th century were discovered during an archaeological excavation in 1995 along with some skeletons, one of which had a silver coin in its mouth. 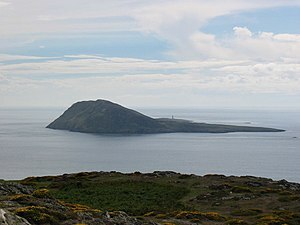 Categories: Bardsey Island, Holy Islands | Tags: Bardsey Island in Gwynedd North Wales, Holy Islands | Permalink.